Andrew Melvin Gooden III was born on the 24th September 1981, in Oakland, California, USA, and is a professional basketball player and currently a free agent, who has played power forward in the NBA for ten different teams including the Memphis Grizzlies (2002-2003), Cleveland Cavaliers (2004-2008), Dallas Mavericks (2009-2010), Milwaukee Bucks (2010-2013), and Washington Wizards (2014-2016). Gooden was selected to the NBA All-Rookie First Team in 2003. His career started in 2002. Have you ever wondered how rich Drew Gooden is, as of early 2017? According to authoritative sources, it has been estimated that Gooden’s net worth is as high as $21 million, an amount earned largely through his successful pro basketball career. In addition to playing basketball, Gooden is an owner of a Wingstop restaurant franchise, which has also improved his wealth. 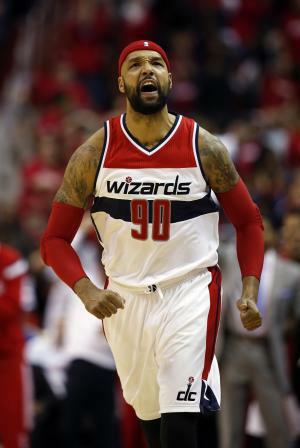 Drew Gooden grew up in California, where he went to the El Cerrito High School and led his team to the 1999 California Interscholastic Federation Boys Division III championship game, but they lost to the Washington Union High School. He enrolled at Kansas University, where he played basketball with Kirk Hinrich and Nick Collison for the Jayhawks from 1999 to 2002. In his senior year, Gooden was named NABC national player of the year after leading the nation’s colleges in rebounds. The Memphis Grizzlies selected him as the 4th overall pick in the 2002 NBA draft, and he played 52 games for the Grizzlies, averaging 12.1 points and 5.8 rebounds per game before he was traded to the Orlando Magic later that season. Drew started 18 out of 19 games for the Magic in 2002-03, averaging 13.6 points and 8.4 rebounds in 28.6 minutes, which helped him to being selected to the NBA All-Rookie First Team in 2003. In July 2004, Gooden signed a contract with the Cleveland Cavaliers which increased his net worth, and averaged 14.4 points and 9.2 rebounds in 82 games, although his numbers declined a bit during the next three season with the Cavs. In 2006-07, the Cavs won the Eastern Conference, defeating the Detroit Pistons in six games, but were swept by the San Antonio Spurs in the NBA Finals. Drew spent the 2007-08 and 2008-09 season with the Chicago Bulls, and displayed solid performances while he was there, but in March 2008 he signed a deal with the San Antonio Spurs, where he played a lesser role, so in the 2009-10 season, Gooden played for the Dallas Mavericks and then the Los Angeles Clippers, averaging career highs of 14.8 points and 9.4 rebounds per game with the Clippers. In July 2010, Drew signed a contract worth $32 million over five years with the Milwaukee Bucks, but only stayed there for three seasons. He recorded his first ever triple-double against the Cavaliers in 2011, recording 15 points, 13 rebounds, and 13 assists, while his second triple-double came against the Cavs in 2012, when he posted 15 points, 10 rebounds, and 13 assists. From February 2014 to July 2016, Gooden played for the Washington Wizards, but he didn’t have a notable role. At the moment, he is an unrestricted free agent. Regarding his personal life, Drew Gooden’s most intimate details such as marital status or the number of children are unknown, as he successfully manages to keep them out of the public eyes. He tried to obtain Finnish citizenship (he is half Finnish, on his mother’s side) in August 2014 to play for their national team, but failed to obtain it in time for the 2014 FIBA Basketball World Cup. Drew enjoys playing the piano. 3 The 1st round draft pick out of of University of Kansas by Memphis Grizzleis. 4 Played forward for the Orlando Magic, Memphis Grizzlies and currently with the Cleveland Cavaliers.